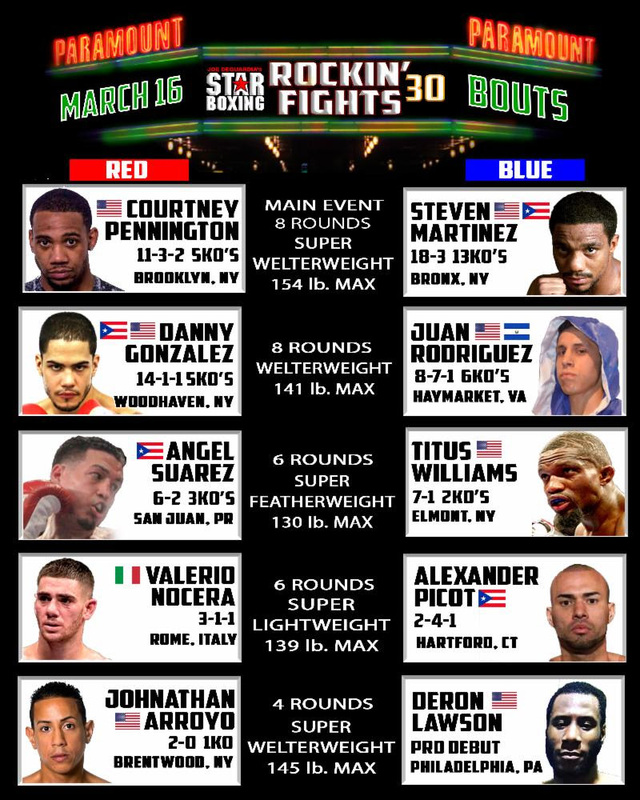 Joe DeGuardia‘s Star Boxing presented the 30th edition of the popular “Rockin Fights” series at the Paramount in Huntington, NY, and number 30 will go down as one of the most memorable events in the recent history of club shows. From top to bottom every fight had the enthusiastic crowd on their feet and produced fireworks all night. The main event 8 round Jr. Middleweight contest saw the streaking Courtney Pennington of Brooklyn, NY, pull off his 4th consecutive upset as he squeaked out a unanimous decision over the Bronx’s Steven Martinez in an absolutely savage fight that could easily be a fight of the year candidate for fights on this level. The two warriors went at it from the opening to the closing bell bringing the fans to a frenzy as they stood toe to toe for the last 30 seconds of round 8. There was little to separate from the 2 combatants and in the end it was Pennington who won by scores of 77-75 on two cards, and 78-74 on the third. Pennington improves to 12-3-2 5KO’s while Martinez drops to 18-4 13 KO’s. Equally as exciting was the 6 round Jr. Lightweight match between Puerto Rico’s Angel Suarez (7-2 3KO) and Elmont, NY native Titus Williams (7-2 2KO). The action was fast and furious throughout. Suarez dropped Williams with a straight right hand in round 1 but Williams fought himself back into the round by landing hard shots of his own. The fighters stood toe to toe for almost the entire fight as both took turns landing vicious punches. Suarez pulled off the upset as he walked away with a unanimous decision. Danny Gonzalez (15-1-1 6KO Woodhaven, NY) bounced back nicely from his last fight, a shocking TKO loss at the hands of Danny O’Connor, stopping the very tough Juan Rodriguez (8-8-1 7KO Haymarket, VA) in the 5th of a scheduled 8 round Jr. Welterweight fight. Keeping with the pattern of the evening the two fighters stood toe to toe for much of the fight with both landing hard shots. The 5th and final round saw Gonzalez hurt Rodriguez with a left right combination and finish him off with a flurry of punches forcing referee Tony Chiarantano to bring a halt to the action against the game Rodriquez. Valerio Nocera, (4-1-1 Roma, IT) won a hard fought 6 round decision over Alexander Picot ( 2-5-1 Hartford, CT) in a Lightweight fight. Johnathan Arroyo (3-0 1KO Brentwood, NY) survived a 4th round knockdown to win a majority 4 round decision over debuting Derron Lawson (0-1 Philadelphia, PA) in a Welterweight fight. Promoter Joe DeGuardia had these thoughts on the evening “These fights reminded me of the golden age of boxing when club shows flourished throughout the state of NY. These were really great, fan-friendly fights and much respect to all 10 warriors who fought their hearts out and put it all on the line out there tonight”. Added Matchmaker Ron Katz “Pennington-Martinez was the closest thing I’ve seen to the legendary battle I put together many years ago between Merqui Sosa and Prince Charles Williams, and Suarez-Williams wasn’t far behind”. The next scheduled date at the Paramount is set for Friday, June 8th.